The details are sketchy. 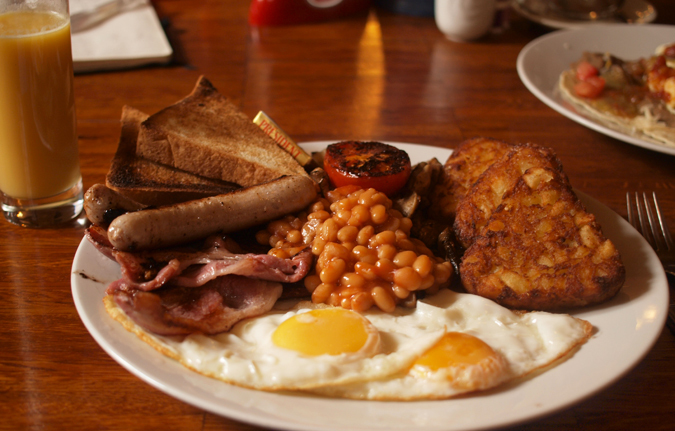 Nobody really knows how and when the English started combining the glorious elements that make up the Full English Breakfast as we know it today. If we look back to the 17th Century, the English brekkie consisted of ale, bread, and beef. Not quite the greasy, fat-filled, calorific start to a long day of farming. By the 18th century, Irish pigs had taken up residence in Wiltshire, of all places, which guaranteed a steady supply of pork for curing. Over time, local butchers developed a method of curing half pork sides in a brine solution, which was known as the ‘Wiltshire cure’. This low-salt, slightly sweet bacon was a big hit. Eating breakfast had become more elaborate and complicated by the 19th century, with rich households consuming cold joints of meat, broiled mackerel, game pies, sausages, bacon and eggs, toast, muffins, and tea and coffee for the most important meal of the day. These days, you should expect to have sausages, eggs, beans, bacon, mushrooms, fried or grilled tomatoes, and hash browns (if you’re lucky!). I consumed six full English breakfasts over the course of six weeks to bring you this article. Some of the breakfasts were amazing, some not so good, others just plain strange. Armed with a camera to document each breakfast, I set out on the mammoth task to find the best full English breakfast in the city. Each breakfast has received a mark out of 5 (5 being the crème de la crème and 0 being the dog’s dinner of full English breakfasts). Open: Sunday – Wednesday 8:30 – 17:00. Thursday – Saturday 8:30 – 10:00. 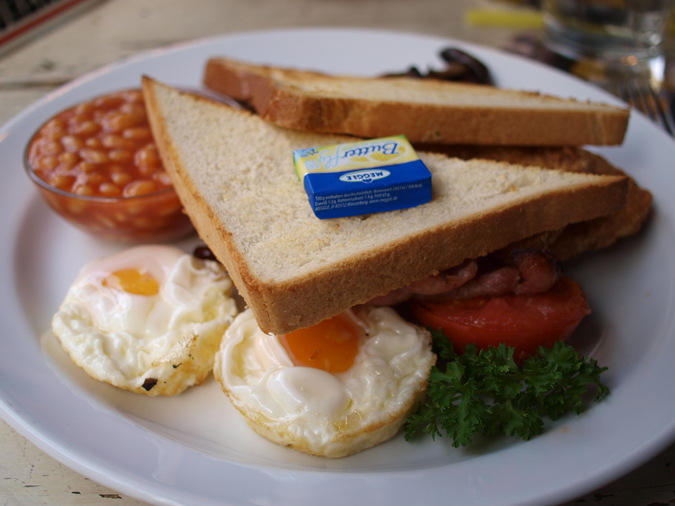 Palladium’s Neo Café offers one of the cheapest ‘Full English’ brekkies from the group at 185 CZK. On paper, you seem to get you a lot for your money. I was intrigued by the ‘baked mushrooms’ and ‘spicy beans’ while reading the menu, and decided to bite the bullet and take the plunge. Neo Café’s English breakfast is a strange one: there were no traditional baked beans, but strange spicy butter beans served in an unusual, oily tomato sauce. No toast but slices of French bread! The sausages were more like frankfurters: salty and garlicky with a pretty unpleasant taste that lingered. The only saving grace was the mushrooms and the bacon: rashers of crispy bacon served under a seasoned fried egg (sunny-side up). The baked tomato was watery and tasteless, adding no extra ‘fry up points’ to this unorthodox ‘English breakfast’. Neo Cafe offers one free hot drink with the breakfast, which is a good touch, but unfortunately a free hot drink wasn’t enough to warm me to this unconventional Full English breakfast. Key Words: Strange, cheap, one free drink, butter beans, oily, no condiments offered. I was looking forward to this breakfast. Jama have catered for Prague’s expat community in the food and beer department for years, so my expectations were high. Unfortunately, they weren’t met. The breakfast was greasy and tasteless. Greasy hash browns, greasy sausages and the unexpected greasy potato wedges (‘home potatoes’). The beans tasted like Heinz and condiments were plentiful, which was a blessing as lots were needed to eat this breakfast. My eggs were cooked over-easy without any preparation options offered, which was a bit irritating especially since the menu states that they will be cooked to your preference. One slice of white toast was served without any butter. In conclusion, an average-priced, tasteless, grease-filled experience which left me feeling pretty grossed out after eating. Open: Daily from 9:00 – Served all day! JJ Murphy’s 295 CZK breakfast was one of the few Full English breakfasts that came with black pudding (a type of congealed blood sausage), and white pudding (similar in texture and taste to black pudding, without the blood). The (Heinz) beans were served in a separate bowl, which proved useful as the plate was pretty full. The sausages were thin and a little on the measly side, but tasty, with an herby flavour. The hash browns were a little overdone and really greasy, which let the meal down a little bit. The bacon was also disappointing. It was quite rubbery, rather than crispy. My eggs were served sunny side up, the bright yellow yolks perfect for dunking my two slices of white bread. It was an average Full English for the 295 CZK cost; there was nothing special about, it in my opinion. If you’re a lover of black or white pudding then this breakfast might be the choice for you. Otherwise, I’m afraid there wasn’t anything else that impressed me for such a high price. Key Words: Black pudding, white pudding, separate beans, Heinz beans, bottled condiments offered. Open: 7 days, 10:00 till late – Served All Day! A very tasty and filling breakfast! Served with plenty of crispy bacon and equally crispy (over-cooked) mushrooms, which would be my only culinary complaint. The Heinz beans were served in a small glass bowl, giving the whole fry up an air of class, which I liked! The eggs were served sunny-side up with deliciously light hash browns, which were crispy and crunchy on the outside and not too greasy on the inside. The sausages were cooked well, with a spicy, herby taste. The Full English is served with toast and butter but without a separate plate which meant having to negotiate the food around my plate as to make space. A minor problem but the extra plate would have made life easier while eating. 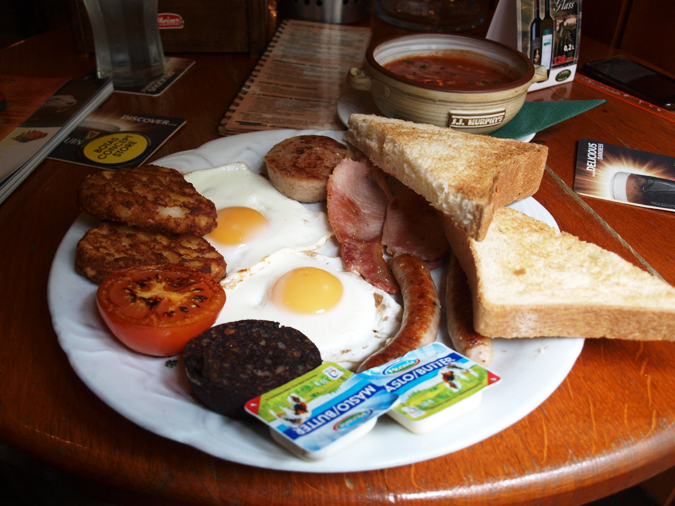 In conclusion, Rocky O’Reilly’s brekkie is a fresh-tasting, greaseless Full English with an unexpected touch of class! Key Words: Heinz beans, crispy bacon, hash browns, overcooked mushrooms. Bohemia bagel’s Full Monty doesn’t actually claim to be a ‘Full English Breakfast’, but it has all of the necessary elements so I decided to give it a whirl. On arrival, the breakfast was well presented, perhaps the best presentation when compared to the other breakfasts I wolfed down for this article. In my opinion, the beans were the only element that let the Full Monty’s appearance down: mushy, in a refried style, with slices of onion and bacon rather than the expected traditional baked beans. That said, they were tasty nonetheless. The two sausages looked plain but were surprisingly tasty and full of flavour, and the same could be said for the mushrooms. The American bacon was crispy and well-cooked, and could easily be mistaken for English! Two eggs were cooked over-easy but still had a runny yolk, which was a pleasant surprise. 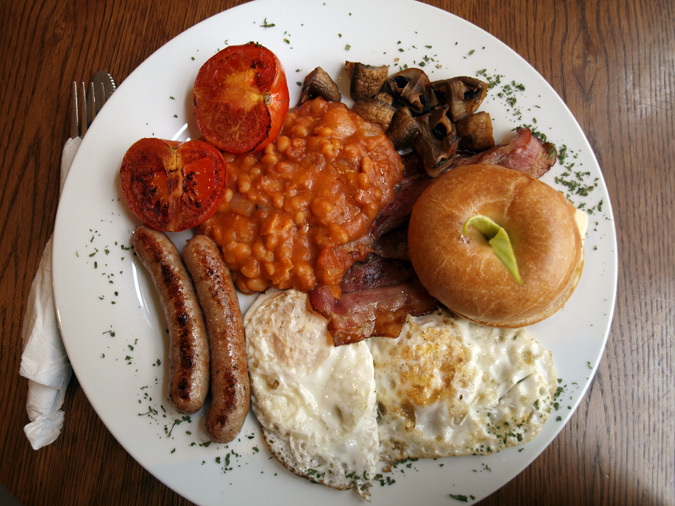 A fair-priced, well-rounded, non-greasy ‘English Breakfast’ with a pleasantly unique twist. I just wanted a little bit more of everything! 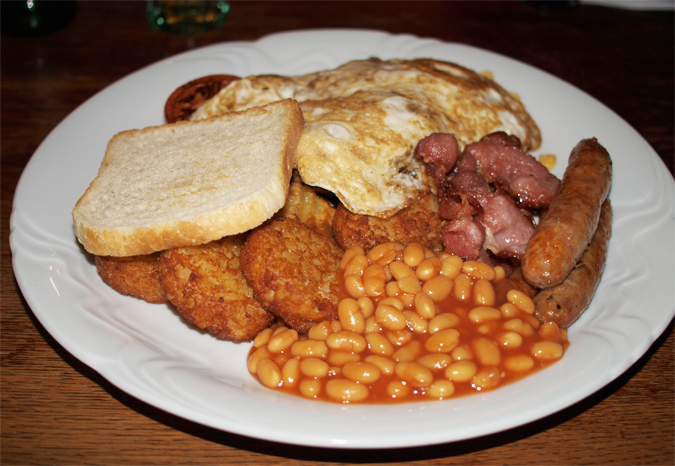 At 245 CZK, Banditos’ Full English comes as the second most expensive brekkie in the group. 245 CZK seems like a lot of money to spend on breakfast in my opinion, but I have to say that their Full English is worth every crown! A flavour-filled, fry-up delight! You’d be hard pushed to find a better full English breakfast in England let alone Prague. Eggs cooked sunny-side up, Heinz beans served with perfectly cooked mushrooms. Thick fluffy hash browns, a well-grilled tomato, and lightly crispy bacon. The breakfast had the perfect levels of grease without feeling to heavy on the tummy. This might be a good option after a heavy night. Bump up your salt and sugar levels with this super-sized brekkie. Brown toast served with butter, condiments readily served on request. 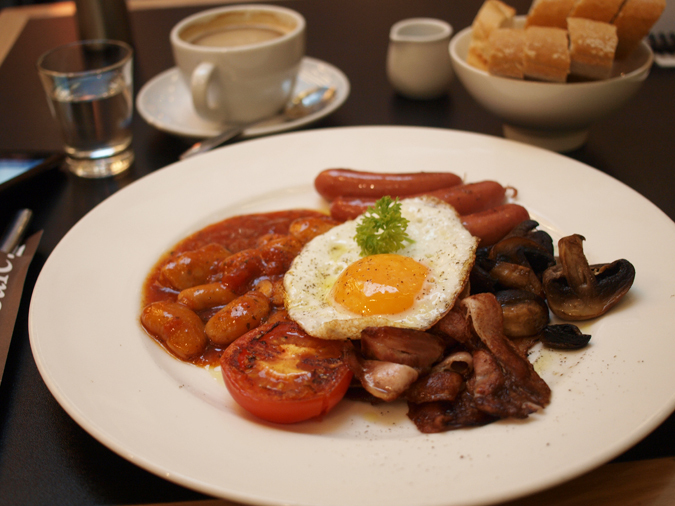 A high-priced, but high-quality traditional English breakfast. Sunny side up — An egg cooked only on one side. The yolk has a liquid texture with the egg white often still a bit runny. Can also be called ‘eggs up’. Over-easy – An egg cooked on both sides.